Every so often, I find it to be a good practice to do an honest self-evaluation of my guitar playing. Where are my deficiencies? What are my strengths? What can I do to improve my problem areas? So on and so forth. This particular round of reflection was a direct result of attending a masterful and inspiring performance by the incomparable Tommy Emmanuel on New Year’s Eve. I have found that “improvement” can be broken down into two categories. They are Horizontal Improvement and Vertical Improvement. Horizontal improvement I define as staying within your skill level, but being able to do it better, more easily, and doing more of it. In my case, I probably added about 70 songs to my repertoire in 2015, but none of those really pushed me as a guitarist. I don’t wish to denigrate horizontal improvement, as it is essential. Vertical Improvement I define as reaching the next level. Beginner to intermediate, intermediate to advanced, advanced to more advanced, etc. This is what I am after personally. It didn’t take me too long to realize that I couldn’t get myself there. No, I would have to take measures that I haven’t taken in years. I would need instruction. This teacher needs a teacher. I booked a session with internationally renowned guitar guru Jamie Andreas. It wasn’t cheap but worth every cent tenfold. Her impartial, not to mention super gifted eyes and ears yielded insights that I could not possibly have reached on my own. What I would really like to impart in this post is the importance of remaining teachable and keeping an open mind. It will be the difference between rising and rambling. Visit Mickey's website to see his performance tracks - call TODAY to schedule him for your next event! Having first picked up the guitar at 14, Mickey has been playing for 30 years. 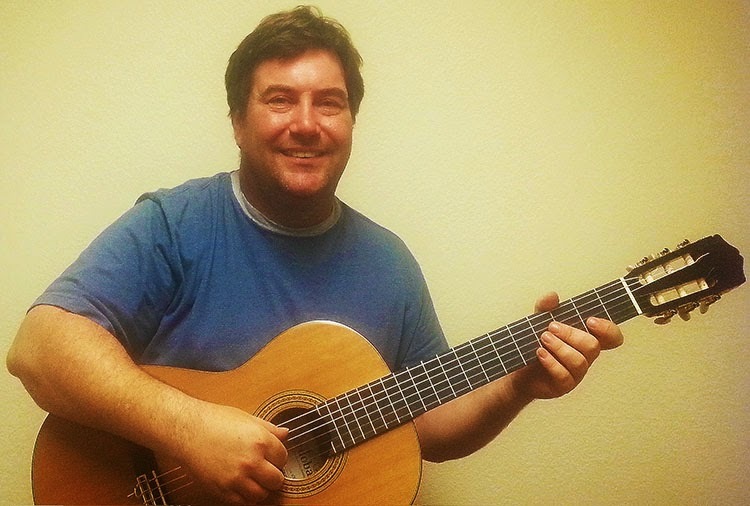 He studied classical and jazz guitar at Mesa Community College and Arizona State University. His professional experience includes performing in a number of bands, including Dryspell (1990-98), and recording for Interscope Records (1998). Mickey toured the U.S. with Dryspell, opening for bands such as Fishbone and Smashmouth. Today, he continues to perform and teach in the Phoenix area, where he lives with his wife, two dogs, and one very well-adjusted cat. Contact me for info about lessons! Effective guitar lessons for all ages — acoustic and electric. Beginners welcome.